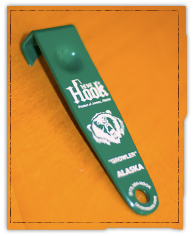 Proceeds form all sales of the BARHOOK are donated to the N.W.F. which promotes sustainable habitats for bear, wolf, and moose populations as well as maintaining river quality for wild salmon runs. By purchasing the BARHOOK, you’ll be supporting both our nations workers and our nations wilderness and wildlife.